We are incredibly proud of our location, based right on the historic Exeter shipping canal. The canal offers calm waters and beautiful scenery just a short paddle from the shop. Most importantly, the Double Locks pub is just a 40 minute trip on the water! If you want to travel further, you can get all the way down the Turf Locks hotel, 6 miles from us in the basin. 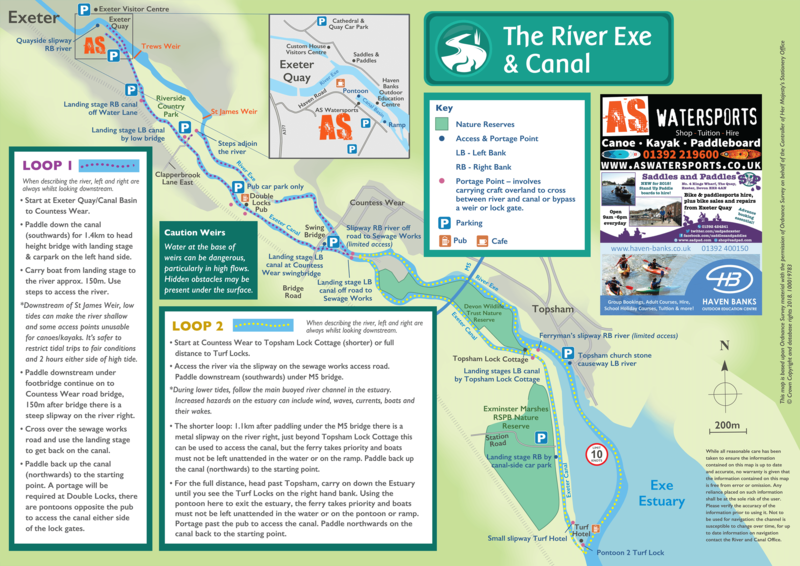 The Canoe Loops are a series of self-guided circular canoeing/ kayaking trails that link the River Exe and Exeter Ship Canal between Exeter Quayside and the Exe Estuary. There are four loops which can be paddled from different access points and in different combinations. 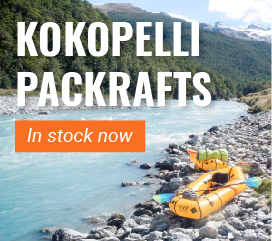 Head down the river and back up the canal and join up loops for longer trips. It takes most people 2-3 hours to paddle each loop and the complete circuit from Exeter Quay to Turf Locks and back is 17km, which can take a full day. To cross between the river and canal and avoid weirs and lock gates, it is necessary to carry craft overland (or pull on trolley). To avoid Trews Weir, paddle down canal entrance and carry canoe between canal & river using points 4 & 3 (150m). If canal entrance lock gates from river are closed, portage using landing stages on LB. To avoid St James’s Weir, carry canoe between portage points 5 & 6 (50m). To cross between river & canal, carry canoe between points 7 & 8 (150m). Immediately downstream of Trews Weir, keep right until you go under the suspension footbridge, then keep left to avoid any anglers. Down river & up canal (4.5km). Be careful of the low canal swing-bridge below access point 8. To cross between river and canal, carry canoe between points 7 & 8 (150m) and 10 & 11 (5m). The canal lock gates at Double Locks can be portaged using landing stage/steps on LB or RB. Down river/estuary & up canal (5km). To cross between river and canal, carry canoe between points 10 & 11 (5m) and 13 & 14 (20m). Follow the main river channel, keep left heading downstream, under the M5 bridge to Topsham Lock cottage. Down estuary & up canal (5km). To cross between river and canal carry canoe between points 13 & 14 (20m) and between points 16 & 17 (up to 200m) to portage the canal lock gates at Turf Lock. In adverse estuary conditions, emergency exit at AP 15. The routes pass many scenic areas and sites of interest. These include the historic Exeter Quayside and Ship Canal, Riverside Valley Park, Topsham Quay, two nature reserves and the Exe Estuary. A the Esturay you may see Kingfishers, egrets, sandpipers, cormorants, avocets (ospreys, seals and otters are occasionally seen). There are several pubs along the route where you can stop for refreshment. Park vehicles in car parks highlighted. Avoid contact with riverbed, aquatic plants and bank-sides, particularly in the shallows. Wildlife should be given a wide berth and passed quietly. Avoid disturbing wading birds roosting at the waters edge and breeding birds. Keep to the main river channel – avoid entering the reedbed nature reserve. Only use recognised public access points and landing places. Do not trespass on private facilities or moor canoes where they may obstruct boats. Keep well away from anglers – pass quietly by the opposite bank avoiding their lines and tackle. Avoid lingering in river pools or below fish passes on weirs (where migratory fish rest). Give way to and do not cross in front of oncoming craft (boats and rowers may have difficulty seeing you). Canoeing can be hazardous and is undertaken at your own risk. You must make your own assessment of dangers based on your knowledge, skills, abilities, experience and the conditions. Water at the base of weirs can be dangerous, particularly in high flows. Hidden obstacles may be present under the surface. Portage points enable canoeists to safely avoid weirs. Ensure you are physically able to carry/pull your canoe over the portage distances and can use the access points (some are not suitable for larger craft). Downstream of St James’s Weir, low tides can make the river too shallow to canoe and some access points unusable. It’s safer to restrict tidal trips to fair conditions and 2 hours either side of high tide. During lower tides, follow the main buoyed river channel in the estuary. Increased hazards on the estuary can include wind, waves, currents, boats and their wakes. Check conditions beforehand via weather reports, river levels and tide tables. Membership of canoe clubs, personal liability insurance and appropriate protective gear are advised (e.g.buoyancy aid, helmet). 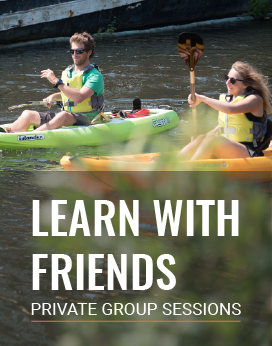 For more information contact a canoe club, shop or association (see contacts on back). 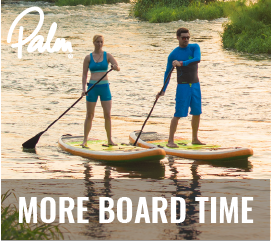 The Exe is a popular destination for all types of paddle sport. Up until a few years ago it was the host to one of the biggest white water races in the UK, the Exe Descent. The race no longer runs but the river still draws the crowds. One reason for the popularity of the Exe is the fact that it is runnable almost all through the winter. There is white water from its source down to Exeter, although the upper reaches beyond Exe Bridge at the confluence with the Barle are usually too shallow and small to run. In the three main sections there is nothing beyond the scope of a beginner so long as there is an experienced supervisor on hand. The most popular sections are: Exe Bridge (nr Dulverton) to Black Cat or Bolham but with difficult access at Bolham its best to make a long trip down to Tiverton, Tiverton to Bickleigh (with the shorter section of Salmon Ponds to Walronds within Tiverton being a good action packed short trip) and Bickleigh to Exeter (long but with a shorter option of Brampford speke to Exeter.) The natural rapids in the upper section are a big draw and the Exe features some well regarded weirs. All weirs small or large should be run with due consideration. High water levels make weirs very dangerous. Inspection is highly recommended if you are unsure. Access: Anchor Inn, Exe Bridge nr Dulverton. There is a big car park next to the river belonging to the Anchor inn. They are tolerant of paddlers as long as the pub is used. Egress: Salmon ponds or Walronds in Tiverton Guide: This is the most natural section of the river and has good salmon fishing during the summer and autumn. There are no real difficulties on this long section. Tiredness and the cold are your biggest challenges. The best thing to do is enjoy the wooded banks and wildlife. The Black Cat get out is only about 4 miles down stream from the get in so is a short section. Our recommendation is to pack a big lunch, warm kit for stopping and definitely leaving dry gear at the bottom and do the whole lot! Access: Access at Salmon ponds across the fields from the main road (A369) up the valley. A layby 200mtrs form the roundabout with the North Devon Link road provides enough room for 2-3 cars, Not a big trailer. Some parking can be found at the collage but is liable to clamping. Try enquiring at the college. Egress: Egress at Walronds at the end of the river walkway river right just after the weir. Guide: If you want a trip with plenty of excitement, then the run from Tiverton (Salmon Ponds) down to Bickleigh Weir gives you the some of the best white water on the Exe without too long stuck on the flat. If the river levels are up then once you pass the long Salmon Ponds weir you will be into a fun and bumpy ride until you pass the large supermarket on river left. As you round the bend high on the left is Tiverton Castle. Here the river flattens a little but still moves quite quickly. Passing under the bridge brings you to Tiverton Town weir. The first of the large weirs on the Exe. An easy shoot on the left is usual but be careful not to hit the wall at speed. A wave can be found here at certain levels and there is a natural feeling to the white water. Walronds weir, at the exit of the Tiverton stretch and an easy take out on the right just after the weir provides a good wave if a little tricky to get on to and can be a lot of fun in the right conditions. The Exe then features natural rapids through the Exe valley all the way to the aptly named Broken weir. This weir does demand an inspection before attempting as it is deteriorating. Then it is a short paddle to Bickleigh Bridge and the following weir. Take care in high water as the stopper can be particularly strong. There is a private egress point immediately after the weir on river left if you don’t fancy the four miles of fairly flat water to the Thorverton weir. This has a history of use by paddlers but is not an official take out. Parking can be found in Bickleigh Mill or the Fishermans Cott. Both establishments look more favourably to those who use the facilities (have a pint and some food). Please be discrete when changing. Thorverton weir, now a bit broken down possibly requiring inspection is followed by a bridge and a second mini weir with another long and winding stretch. Be careful as there is a railway bridge immediately after a sharp right hander. This can be difficult, especially if the river is high. Just past the bridge is The Four Pynes wier, which is great for learning white water moves. In the summer months you often find Squirt boaters harnessing their “Charc”. Different stoppers and fish shoots make for the interest here. A mile below Four Pynes is Cowley Steps. (take the left hand branch of the river when you see it split) Possibly not suitable for beginners, there is an alternative route as well as portage if you don’t feel confident to take the steps. The righthand fork of the river takes you to a lumpy and large broken weir near Exwick Mill. This is difficult to portage and to run so be sure you have the correct channel upstream! Once you are past Exeter’s flood defences, you come to Flowerpots weir. This is a magnet for playboaters whenever the river is up and if they can get away, this is likely to be where you will find most of Exeter’s white water kayaking fraternity after heavy rains. The top weir produces a wave on the river right (looking down stream) and a small eddy (Head weir) . Great for some surf fun. The weir below, Flower pots with the big foot bridge Millers Crossing above it is best run on the left avoiding the bigger right handside with is potentially fatal second step. The stopper at the base of the left hand side is the spot for playing, next to the concrete ledge. Parking can be found on the street above or in Mill on the Exe pub car park. Please be considerate and buy a drink or food. The management don’t take to naked paddlers that much! >From here you are through central Exeter, the quay is possibly the most sensible egress point (feel free to pop in and see us). Downstream from the quay there are two more weirs on the river, Trews and St James weir, known as Salmon pool, both of which can be fun but should be examined before attempting. From here you can either break out and carry across to the canal for a return to the quay or you can continue on out of the city and to the estuary. Be aware that past Salmon Pool weir the river is tidal, so you are likely to face adverse conditions if you time your trip wrong. The journey out of the city is pleasant, but there is no more whitewater. The Exe from the quay down to Topsham and beyond can be paddled as part of the Exe Circuit. See the Exeter Canoe Loops section for more information. 5 -7.5 on the gauge = Line stopper with weird wave in the middle. Generally Medium. 5.5 on the gauge or less = Not much happening at pots. Generally Low.